I read some great books in August. This is why I'm a writer. If I can move one person, compel one reader to mark passages in blue crayon in a book that does not belong to them -- words that have made an impact, words they need at that exact moment -- then I will have succeeded. My favorite quote: "I would give someone a record so they could love the record, not so they would always know that I gave it to them." As much as I loved THE PERKS OF BEING A WALLFLOWER and am looking forward to the movie next month, it wasn't the Best Book of August for me. That honor goes to THE SUMMER OF NO REGRETS by Katherine Grace Bond. So when Luke came into my life, I decided to keep him a secret. Maybe he was a dead-ringer for notorious Hollywood bad boy Trent Yves. And it was possible that everything he told me was a lie. And yes, I was probably asking for trouble. But all I saw was Luke--sweet, funny, caring--someone who would let me be the real me. But which was the real him? Oh, this book. Where to begin? The cover. I will start with the cover. It's a bit deceiving. Yes, there is a summer romance, a good one, but this book is so much more than that. Brigitta spends her summer searching -- for the truth, for the Truth (the universal one), for understanding, for a way to grieve, for her place in the world. The net of her search captures the ordinary and the extraordinary, baby cougars, a shaman (her father), a boy who may or may not be a famous teen heartthrob, a secret blog, a friendship on the rocks, and a road trip home. It's a lovely book, serious yet with just the right amount of lightness. At many points, I was on the verge of tears. Brigitta's story spoke to me, grabbed me at the heart of the seventeen-year-old girl I once was, the one full of questions and theories, lighting candles and burning incense and wondering about the world outside herself. I've read several reviews from readers who had different expectations for this book based on the cover and the blurb and were disappointed. I strive to read books without expectations, although sometimes the hype of a book precedes it. But when I do, when I approach a book with an open mind and an open heart, sometimes I find a most amazing gift. THE SUMMER OF NO REGRETS is one of those gifts. What was August's Best Book for you? I don't usually go for romance novels, and I would most certainly have passed over this book based on the cover alone. Only after reading your review might I have picked it up and given it a chance to blow me away. Perhaps an injustice has been done by the publisher? I can't wait to read Perks of Being a Wallflower, that's near the top of my list. I love the crayon, that's so cool! The summer one looks interesting too! I don't know why it took me so long to read it, but I wanted to watch it before I saw the movie! I've never heard of this one, and I'm gonna have to head to Goodreads and mark it TBR now. Contemporary romance owns my heart. I actually have MY LIFE NEXT DOOR on my shelf right now, waiting to be read--did you enjoy that one? I enjoyed MY LIFE NEXT DOOR but it wasn't one of my favorites. It was one of those books that came with a lot of hype - so it didn't live up to my expectations and I was a little disappointed. But it was good and I hope you like it! I used to work in a hospital and Rebecca Skloot came to speak about her book "Henrietta Lacks". It is such a great story. Ms. Lack's was done a great injustice, but her life has had an extreme impact on others. Something we can all strive for. Isn't it an amazing story? My jaw dropped several times while I was reading. 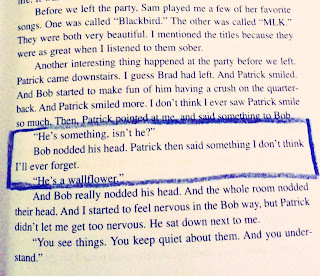 I read and loved Perks of Being a Wallflower, too. I'll have to check out The Summer of No Regrets. Are you looking forward to the movie? OK, first off I need to follow your blog because we have the same taste in books. I haven't read Perks just yet but now that the film is coming out in a few weeks I've gotta get on that! Summer of No Regrets sounds like just the book for me, and I might even get to use it as a comparative work for my own novel (squee!). I've had Girl Next Door on my list too. So many books, so little time! Thanks for stopping by - it's always nice to meet like-minded readers! :) Let me know what you think of it. I'm really curious about your novel and I hope to learn more about it soon! Also, I found the Henrietta Lacks book fascinating. My work did a book discussion on it, I work in healthcare and it was so interesting to hear people's perspective from the medical field. I love a good summer themed book, but I didn't really read any this summer! May have to check this one out while there is still some summer left! I'll have to put The Summer of No Regrets on my TBR. I have to admit, I started Perks and it's one of very few books I put down after only a chapter or two. People rave about it but I just couldn't get into it. I'll be honest, I had some trouble getting into it, too, but once I got going I couldn't put it down. 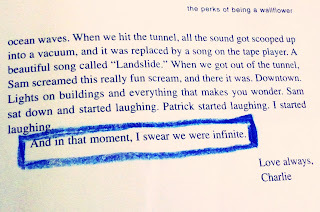 I love what you discovered in the library copy of the Perks of Being a Wallflower, I feel that way too. Hopefully one day someone will mark up something I've written. I read that book earlier this summer and loved it to pieces. I have to look into the Summer of No Regrets. I agree, I would have passed it up based on the cover, but I am starting to get over that since recently I have been reading some good books with bad covers. I will have to check it out. I know - wouldn't it be awesome for someone to mark up your book?! Good books with bad covers. Sounds like a blog topic! 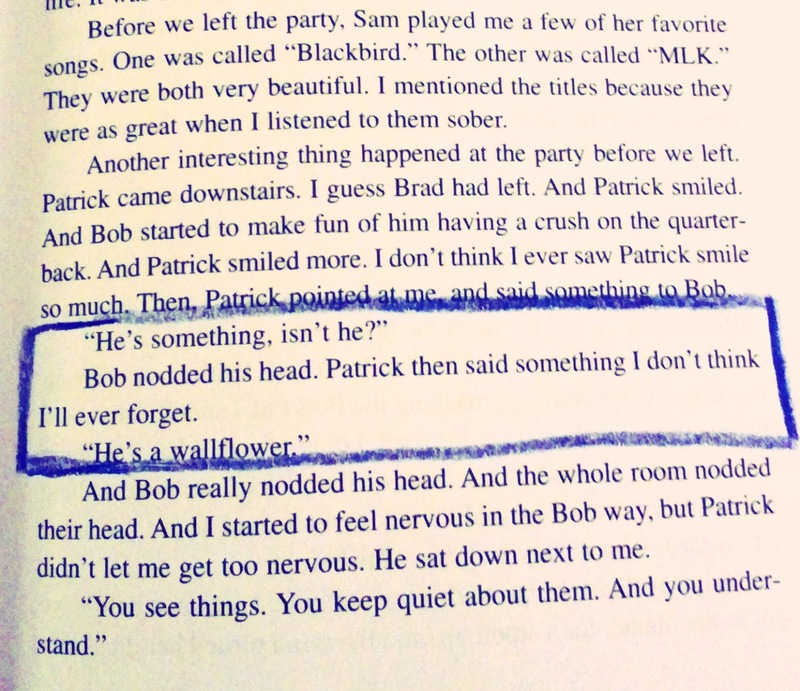 I really need to read Perks of Being a Wallflower. I want to before the movie comes out. Sounds like I'm going to have to add SUMMER OF NO REGRETS to my list! Perks was my choice. And it was a reread for me. Love, love, love that book. I will be popping over to check out your post soon! 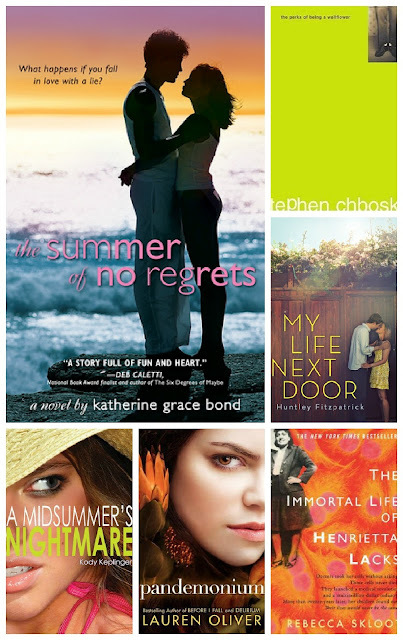 Just added THE SUMMER OF NO REGRETS to my TBR list - great review, I'm looking forward to reading it! And yes, you had some pretty stellar reads this month - I'm still looking forward to reading THE IMMORTAL LIFE OF HENRIETTA LACKS! I've had this one since it first came out, but yet, haven't bumped it up on the list. I waited a long time to read HENRIETTA LACKS - it took my book club to choose it to finally get around to it! Never heard of it, but I'm interested in The Wallflower. That sounds like an interesting read. Well, if it can bring you to tears (or almost), that's a winner, in my opinion! Perks looks like a great read too - and the movie looks amazing. I don't normally go for the summer romance types, but I might have to look into this one! It's not your typical summer romance, that's for sure! I've been looking at this book. I'll have to read it soon. Bless you, Sara! You've made my night. And now I'll have to read HENRIETTA LACKS, and THE PERKS OF BEING A WALLFLOWER. May you write books that fill with crayoned boxes. Katherine, thank you for stopping by and for your kind words. It means so much! 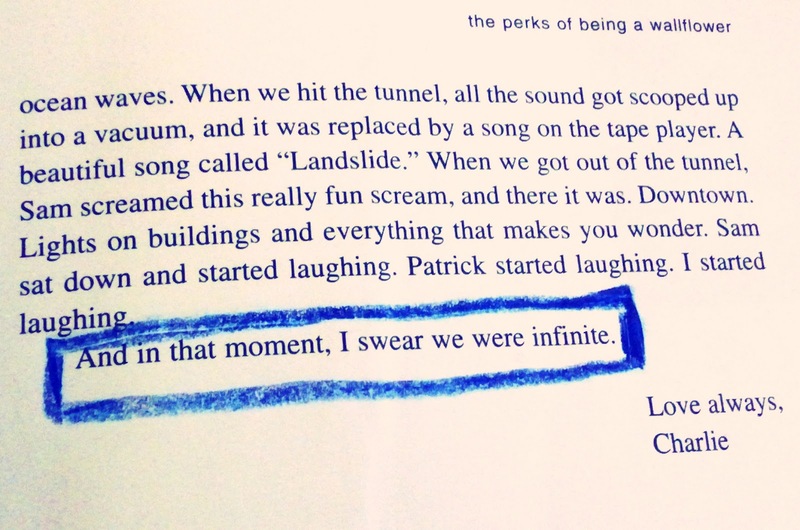 I loved The Perks of Being a Wallflower and can't wait for the film! This book you've chosen sounds great. I'm a romance fan at all but I think I could get hooked on it. At least from what you've said it's more than girl meets boy, boy meets girl.